A month or so back, NCSE got an e-mail from John Pollock asking if we'd be interested in reviewing his new app, and it somehow ended up in my lap. Now, I’m not really an app person, but this app was right up my alley: The Darwin Synthetic Interview. Basically, Pollock and his colleagues have brought Darwin to life—on our portable devices, anyway—and made it possible for us to ask him questions. It’s not quite as cool as it sounds because you can’t ask him anything (“Mr. Darwin, do you like the blogs I write?”), and you don’t talk to him directly. But it’s still pretty darn cool, just won a Parent's Choice Award, and has arrived just in time for Darwin Day! Hooray! To create the app, the first thing Pollock did was to ask more than 1,000 adults and K–12 students, “if you could ask Darwin anything, what would it be?” He then picked the 199 most popular questions and passed them off to David Lampe, a professor at Duquesne University. Lampe was given the task of composing the responses, using Darwin’s own words from his notebooks, books, letters, and autobiography. So many topics, so little time. I spent about five hours exploring the app on Monday—and even then I only got through about one-third of the available material. There is, simply put, a lot there. After you select your question, Darwin (in the form of actor Randy Kovitz, who plays Darwin with charm and aplomb) answers following Lampe’s script. 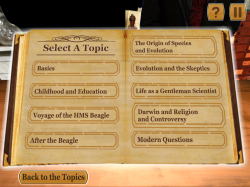 If the experience was limited to just interacting with Darwin, I probably could have gotten through all 199 questions easily. However, many—if not most—questions include supplemental answers provided by living experts. Many are scientists, of course, but there are also some theologians and historians. Vic Walczak from the ACLU of Pennsylvania, who helped to litigate Kitzmiller v. Dover, even contributes some legal commentary. In some cases, these outside voices are necessary to fill in some gaps. 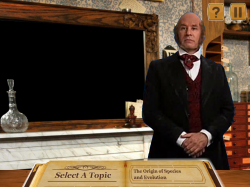 If you ask Darwin about the Scopes “monkey trial,” for example, he replies: “I have no idea what you’re talking about. Putting monkeys on trial? That sounds ridiculous. In what unfortunate place did this occur?” Luckily, historian Edward J. Larson, the all-around awesomesauce biologist Ken Miller, and Vic Walczak are there to help Darwin out. In other places, these voices complement Darwin’s answers, providing additional Darwin has no opinion on the Scopes trial, but Vic Walczak does. insights. Darwin didn’t know about mutations, for example, and instead talks about “variations,” admitting that he is ignorant about how these are passed down through generations. The modern voices provide more in-depth answers based on our current understanding of genetics. “Chatting” with Darwin was really enjoyable, and I imagine that for people who are unfamiliar with his life and work, there are a lot of surprises to be had. But even those familiar with Darwin will have fun. For example, I already knew that Darwin’s ideas got a huge boost from the discovery of Archaeopteryx shortly after the Origin was published. But it was a hoot to hear about it from Darwin himself, especially since he starts his answer about “missing links” by gently chiding, “Missing links, as you call them…are probably better called transitional forms.” That’s right, Darwin, it’s a terrible term, I agree! And you didn’t use it, so we know it’s not your fault. Then, when describing Archaeopteryx, Kovitz gets as close to giddy as I imagine Darwin would have dared. I think there is no reason to think that humans are an exception from the general process of common descent…Humans, in fact, appear to be a modified great ape… To take any other view is to admit that our own structure and that of the animals around us is a mere snare meant to entrap our judgment. But that’s not all. My theory makes certain predictions. If I’m right, we should find human fossils one day that validate my hypothesis. And of course, we did find human fossils to validate his hypothesis—tons of them. Darwin offers a similarly great answer to the question “If humans evolved from monkeys, why are monkeys still here?” He explains that “when we talk about evolution, entire groups don’t disappear when new ones evolve” and that “humans did not evolve from monkeys,” they are our “cousins, not direct ancestors.” (I couldn’t have said it better myself!) Ken Miller follows this up by posing the question, “Where did Protestants come from?” His point is that if there shouldn’t be monkeys, given the evolution of humans, then there shouldn’t be Catholics, either, given the emergence of Protestants. &quot;Darwin&quot; talks about natural selection. While we’re on this topic, I found Darwin’s answers to questions about religion edifying. I knew about his beliefs in broad strokes, but it felt different coming from him, in what I knew to be his own words. When asked if he believes in God, Darwin explains how his beliefs have changed and fluctuated over his lifetime. He says that he is not yet “settled” on this matter, but he is not an atheist; rather, the term “agnostic” best describes his feelings. But Darwin does not advocate for agnosticism in others. Asked if you can believe in God and evolution, Darwin says, “I don’t see why not. It seems to me absurd to doubt that a man may be an ardent theist and an evolutionist at the same time,” and he goes on to give examples of religious figures from his day that supported evolution. It all makes me wish that Darwin were alive today to help us resolve the religion/evolution conflict that is still causing so much trouble. If you’re interested in chatting with Darwin yourself, the app is available through iTunes, Google Play, and the Amazon App Store. The full version costs $9.99 and a “lite” version (with about 20% of the questions) is available for free. For educators, lesson plans to accompany either version can be downloaded here. If you download and check them out, please report back and tell me what you think. And keep your eyes on the blog—I’ll have a Q&A with the app’s creator, John Pollock, posted soon.